As we get older our bodies seem to slow down and, as a result, we don’t get the amount of exercise we really need to stay healthy. I found that one way to get a bit more exercise, without strain or pain, is to add a regimen to my shower time. There are some benefits to this, particularly if you shower in the morning. First, you are expending a few calories before you eat. Having fasted all night, you should have already used the quick fuels your body creates from food. By morning, your exercise should be fueled by your fat stores. I find that if I exercise, briefly, in the shower in the morning, then do some yard work and put off breakfast until sometime after ten AM I tend to lose weight. Perhaps you will too. Second, the warm shower water tends to loosen stiff joints, muscles, tendons and ligaments allowing for a bit more freedom of movement without pain. While it may be true that if there is no pain, there is no gain, we don’t want any of our pain to be associated with damaged body parts. These are easy exercises, so if you are already fit and regularly spend time working out, they won’t do much for you. On the other hand, if you are just getting started with exercise and want to try some easy movements, these are for you. Since these exercises are done in the shower, be sure your shower is properly equipped with a non-slip floor. I don’t want anyone slipping or falling! Many of us have trouble doing even one real push-up, however almost anyone can do a wall pushup. It’s just a matter of standing facing the shower wall (typically with your back to the flowing water) and doing push-ups against the wall. Put both hands on the wall at about shoulder level then step backwards a bit. The farther backward you have your feet, the more difficult and more effective this exercise will be as more pressure will be put on your hands. This will require more effort to complete a push up. Please don’t go for the glory – start fairly close to the wall and try a few push-ups. If you feel no effort is involved, move your feet back a little more and try again. You may start with your feet fairly close to the wall, but over time you will build some strength and be able to move your feet backward more. Don’t ever move your feet backward so far that you feel like they might slip out from beneath you. They might and you could be seriously injured. Taller people will be limited in that their feet may reach the opposite wall. If you can do a lot of push-ups in that position, you are probably ready to take this exercise out of the shower and start doing real pushups on the floor. There is not specific number of repetitions you need to do, just pay attention to your body. When it gets hard to do any more push-ups, quit and try again tomorrow. If you get to the point where it seems easy to go through 25 reps, move your feet back a little more and see how it goes. To be effective, you should feel a little burn in your arms or shoulders before you quit. This exercise helps build strength in your arms and shoulders. In addition, if you can do these with your heels on the floor, you will be stretching your achilles tendon a little, perhaps just enough to stave off plantar fasciitis. This exercise can help with your flexibility and with lower back pain as well as stretching various muscle groups and building thigh strength. Simply stand in the shower, again with the water flowing on your back, put one hand on the wall that’s beside you and keep it there. It doesn’t matter which hand. We are not going to be switching hands. 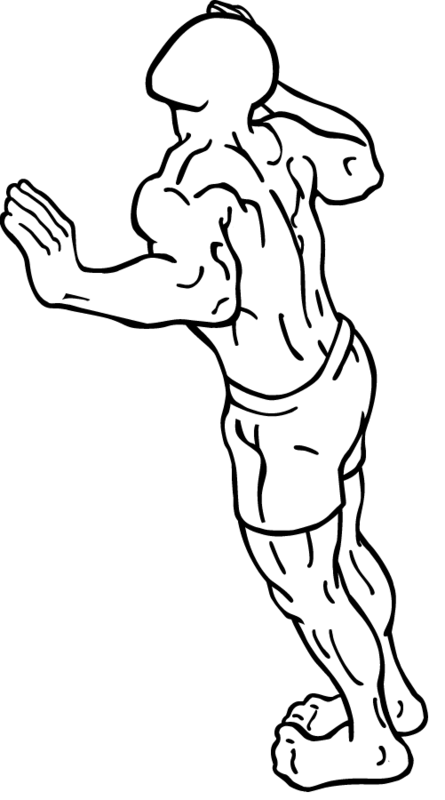 Just keep it on the wall to provide stability while you are performing this exercise. 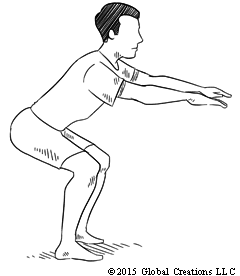 Next, lift one knee up as high as you can get it then pull it up as far as you can with your free hand. You may hear some creaking and clicking, so be careful. If there is any pain, you may have a knee or hip issue that you should discuss with your doctor and you should not do this exercise. If all goes smoothly and you can pull your knee close to your chest, you will be stretching your lower back muscles as well as loosening up your hip and knee joints. 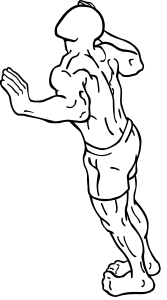 This is a stretching exercise so a lot of reps isn’t important. I usually do ten, five with each leg. Over time you will be able to get your knee right up to your chest. This last exercise, shallow knee bends or squats, will also help build strength in your thighs. 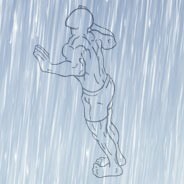 Stand in the shower with the water on your back and your feet about shoulder-width apart. Bend your knees as if you are going to sit down while keeping your torso upright. You may need to lean your torso a bit forward or position your hands to retain your balance. You can also use the wall to stabilize yourself. Do not do a deep knee bend. If your thighs are parallel to the ground, you are going way too far and putting excessive stress on your knees. Many experts warn against doing deep knee bends even if you are in good physical condition. Knee damage can put a quick stop to your outdoor activities, so be careful. For some of us, getting too low with this exercise will leave us unable to stand back up. Start by squatting just a little and standing up. Do enough repetitions to get a little burn in your thighs, then quit. As you repeat this regimen over time, you will be able to do more reps and squat more deeply. This isn’t a race and no one is watching, so take your time, start lowly and keep safe. I find 25 reps to be sufficient, but you may need to work up to that. For more on the proper form for this exercise see Squats and Knee Bend Exercises. Once you figure out how to do these exercises in the shower, you can combine your shower activities. You can let your shampoo or hair rinse stay in your hair while you do your push-ups. The other exercises can be done while soaping up and rinsing off. If you are prone to falling, don’t try to do too many things at once. Remember that the warm water flow is providing a useful purpose by simply helping to relax and loosen your body while you exercise. Don’t like the idea of exercising in the shower? No problem, you can do these exercises anywhere. Do you exercise in the shower? What exercises have you tried that worked for you? Let us know in the comments below! Wow, this is a great idea. I read that it’s good to sneak in a few exercises into your daily routine but let’s be honest, that can be difficult. But sense we all have to shower and are free from distractions at that time, this is a great way to start your day off and make exercise more interesting and easy. Thanks for the tips! Hello! How are you? My name is Blaise.I daily do 50 push up in the shower and it really helps to spend the rest of my day healthy.You can also try this. Hi, I’m Renee and something I’ve done in the shower are sit-ups and/or crunches just depends what I’m feeling in the day.